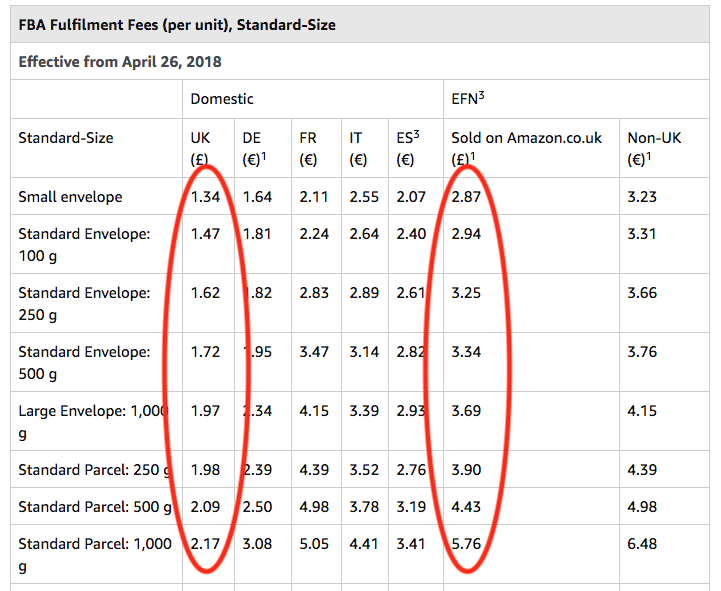 In this post I’m going to explain how to sell your Amazon products in Europe using EFN (European Fulfilment Network), how to price and maximise your profits. This is aimed at sellers with a co.uk account (but the majority will be the same for other home marketplaces). 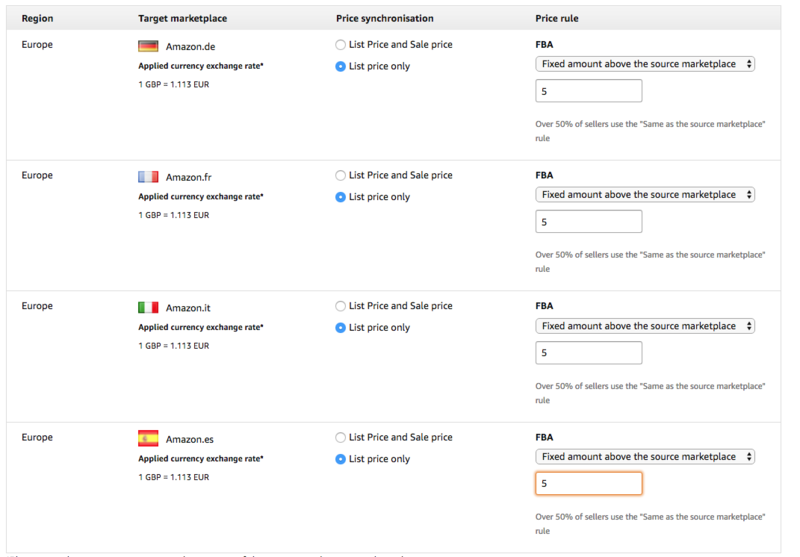 One of the great things about selling on amazon.co.uk is that you can automatically list your items on the other European marketplaces (France, Spain, Italy and Germany) and if you’re doing FBA then Amazon will take care of the deliveries (for an extra charge of course). The image shows my Amazon sales for Q4 2017, the combined sales in the rest of Europe were close to my sales in the UK, profit wise they were actually greater. 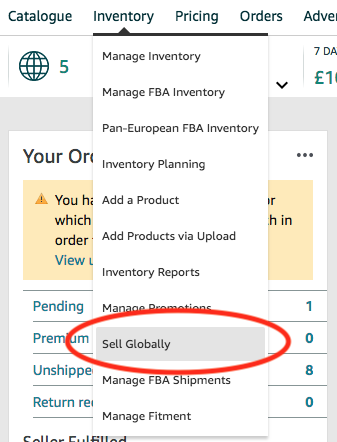 To enable selling in Europe, in Seller Central go to “Inventory -> Sell Globally”. (I’m not going to do screen shots of EVERYTHING as that would take too long and be pretty damn tedious to write). As I already sell in Europe the next page now shows a pretty little graph of my sales. What you need to do to enable sales (or change your European pricing rules) is click the link in the new top menu “Build International Listings”, on this page you select which marketplaces to sell in (do them all). You also need to change the “connections” pricing, I’d recommend setting it to £5 more (explained more in the next section). I only bother creating listing that are FBA as I don’t want (or need) the hassle of shipping FBM (Fulfilled By Merchant) orders myself to Europe (the Channel Islands are bad enough). One thing you need to account for are the increased fees that Amazon charge for shipping to Europe. All fees are available here. Some people recommend pricing a percentage higher, I wouldn’t recommend this as it under prices cheap items (so you could make a loss) and it overprices your expensive stuff (so it will never sell). By default I would add on a fixed fee of £5, to cover the extra charges. This makes standard size things more profitable and oversize stuff less so, but it’s quick and easy. If you’ve got the time (and not too many products) you can manually set different prices on different marketplaces. If you use a re-pricer (which you should (different post)) then you can normally setup rules o multiple marketplaces. A cool and pretty cheap tool I use is EUEssentials (aff link), which lets you see and modify prices across all marketplaces very quickly (it also does some auto repricing but I haven’t experimented with that yet). Amazon are happy enough to pay your Euro earnings in to your sterling bank account, DON’T. The exchange rate they use is not the best (you know they have overheads and they’re not exactly a charity). Get your self a Euro bank account (much easier than you expect). I started off using World First (pretty good), by default they charge 2.5% but you can haggle them down (after using them for a while one email got them to reduce their rate to 2%). 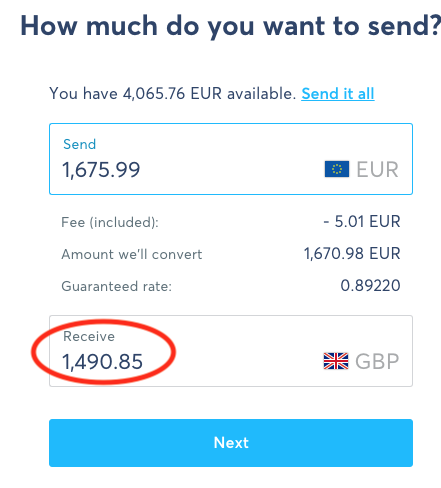 The best service I’ve found to use now is Transferwise, they only charge 0.3% and you can also get a Euro bankcard so you can pay (and withdraw) in Euros without any conversion fees. It’s actually worth getting an account simply for holiday money. 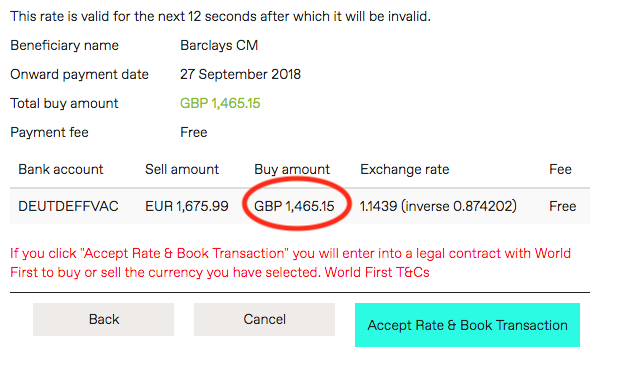 I did an identical transfer on World First and TransferWise at the same time to do a comparison, images below which speak for themselves. If I’d made the switch sooner I’d be quite a few grand better off, d’oh! So here’s a big affiliate link to Transferwise, sign up and save yourself a shed load of fees and I get a tenner for telling you about it :). I’ve also had a warning for selling biocidal products (some cleaning thing). You need to check Performance notifications daily on ALL marketplaces that you sell on, sometimes they only give you 48 hours to correct any lapses in judgement. You also want to check your customer reviews for potential problems. I had a few complaints about a board game being in English whilst the listing showed a different language, so I simply removed the listing from other marketplaces. I say simply but it’s a bit of a pain as you need to go into your inventory of each offending marketplace, find the listing and delete it. Hmmm that gives me a product idea. You also need to watch out for VAT, different countries have different thresholds but if you’re close to hitting one that should mean you’re doing ok and have looked into it. BREXIT, ha – who knows what that’s going to mean (VAT complications likely) but I’m guessing it’s going to make stuff a bit more complicated (and expensive).